In May of 2009 when the Dalai Lama agreed to allow the Theosophical Society in America to host his visit to Chicago, we made a determination that all of the proceeds from the event would be given away. 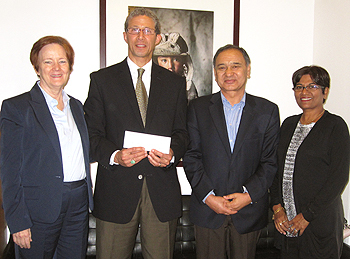 We had targeted the Tibet Fund to be the recipient of those funds. The Tibet Fund is a US-based 501c3 charitable organization founded by the Dalai Lama to serve the Tibetan refugee community. It was the president of the fund, Rinchen Dharlo, who made the initial suggestion that led to our audience with the Dalai Lama. Since it’s founding in 1981, the fund has grown to become the primary funding vehicle for Tibetan run institutions and grassroots organizations that provide refugee rehabilitation, health care, education, religious and cultural programs, elder care, as well as community and economic development programs in the exile community. After reviewing all of the budgetary projections and determining the best case scenarios, we set our sights on a grand total of $250,000 after all costs. We were optimistic. What we had not anticipated was the overwhelming generosity of our members, the Chicago-based host committee organizers, and the number of exceedingly generous patrons who support the Dalai Lama's vision. In all, we received $225,000 in cash contributions. We also received numerous in-kind contributions that enabled us to reduce costs and produce an event of the highest caliber. Even a partial list of the noncash donations is long: the board of directors for the Harris Theater waived its rental fee; the creative team at Ogilvy and Mather developed original artwork for two outstanding posters, then paid for the printing of them (sale of these posters and tee-shirts using the images brought in almost $12,000); the actress, Jennifer Beals, gave tirelessly of her time and connections in promoting the event (through her, Illinois governor Pat Quinn attended); a team of photographers donated their services to document the event; the CEO of iClips, a company that provides streaming video messaging, sent a crew from St. Louis consisting of three cameramen and a producer to livestream the events on the Internet, they then turned over all of their footage to the TSA for the production of the DVDs and video we have produced; a private jet seating twelve people was donated to bring His Holiness from Washington, DC to Chicago on the morning of the event; the Dalai Lama's hotel suite at one of Chicago's premiere locations was donated; and on and on. The bottom line is that on September 19, 2011, I traveled to New York City. It was a proud moment when, on behalf of the Theosophical Society in America, I presented checks for slightly more than $400,000 to the Tibet Fund and the Dalai Lama Trust!